Let me tell you a little bit about myself. Not too much I promise. When I was a kid, there was nothing that thrilled me more than a mystery and trying to solve it. I couldn’t get enough of the game Where in the World is Carmen Sandiego? When I wasn’t playing that game, I was trying to write a book. I was 10 years old. I used floppy disks to save my work on a computer we had at home. I loved it. I was immersed in reading books from early Kindergarten on. I was reading adult-level chapter books by second grade. I was in love with the written word. As an adult, I entered Ithaca College in print journalism. I wrote for The Ithacan and won an Associated Press Award for a news series I wrote. I was a contributing writer for a local newspaper, The Syracuse Post-Standard for a summer. I had been writing primarily about health topics and had a passion for health. I ended up finishing Ithaca College with a BS in Health Education. 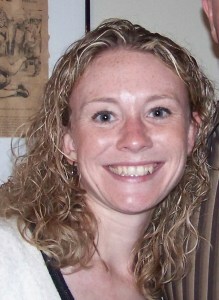 I began teaching health education and completed an MSEd in Health Education from SUNY Cortland. After having my son, I decided to stay home part time and work with our family business. During this time, I felt the urge to begin re-exploring my writing. I could use my health education experience to share with others again. I began a blog – balancedisease.com. It got me writing about my experience with a diagnosis of SLE (lupus), and allowed me to share my experience in finding a diagnosis of PFAPA for my infant son. As he aged, and time went on, I learned my ability to help people get a diagnosis for unknown medical conditions from their doctor was a gift. I was able to share the information and tools I used with others and truly help them get some answers. I wrote my books about obtaining a diagnosis for your child, and PFAPA (our story) & Other Periodic Fever Conditions to help families who feel alone and without help. When you have a sick child, or you are sick yourself, and you can’t get physicians to help and you are suffering, you feel lost. It’s hard to connect with those around you because nobody understands. You just want the pain and suffering to stop and someone to give you answers. There is a way to get answers. I got an answer for myself and my son. I want to help people find answers. 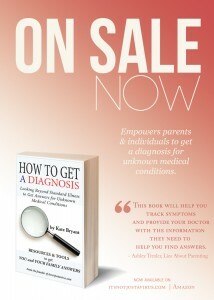 How To Get a Diagnosis is a 72-page book that provides a step-by-step process of how I got a diagnosis for my son’s periodic fever condition. It contains tools and resources so you can do the same thing! 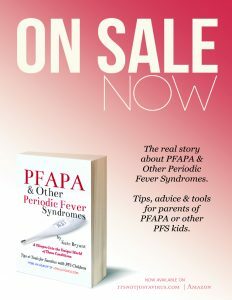 PFAPA & Other Periodic Fever Syndromes – The real deal with living with PFAPA & Other PFS. Get tips and tools to help ease the condition. 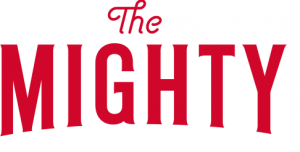 GUEST SPEAKING – Interested in having me as a guest speaker? Contact me here. 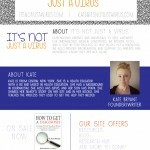 AFFILIATES – Interested in becoming affiliated with my books and products? Both of my books are on amazon.com. For any other inquiries – Contact me here. Download my media packet here.